The Greenspawn Assassin slips into an untapped design space -- an uncommon hero that synergizes with multiple copies of itself. It's an area with a great deal of potential. Greenspawns are cheap and have the tools they need to be effective assassins. Balance is the factor I find most questionable about the Greenspawn Assassin. Six move, 4 attack, 4 defense, and 3 life are fantastic stats for a 50pt figure, and it has a ranged special attack as well. Ambush is difficult to quantify in terms of value as it requires multiple Greenspawns to use. The most direct comparison is Shiori. Shiori can be a 4/4, but only at certain times. Normally she is a 3/3 with 6 move and 3 life, and also has a ranged special attack. Knife Throw is a bit shorter range than Shuriken, but is more generally useful and has the very helpful defense-reducing capability. Shiori does have Phantom Walk, which is certainly valuable, but she is also 10pts more and does not have multiple attack potential (without Dashi Tokainto). Shiori is bad (again, not counting Dashi), but does set a standard in terms of unit value at that price range. Other comparisons include Me-Burg-Sa, Nerak, Iskra, Arkmer, Brave Arrow, Deadeye Dan, Zetacron, Theracus, Darrak Ambershard, Samuel Brown, and Elaria the Pale. Few of these have quite the survivability of the Greenspawn Assassin; Arkmer's abilities help him close the gap and Brave Arrow's 4 life and 3 defense plus Concealment is comparable, though Arkmer needs elf help and Brave Arrow isn't as good against melee. Neither of these have as much movement normally. Brave Arrow has Tracking, but cannot attack while using it and has no range attack. C3V's Elaria has Slippery, but that is inconsistent and only helpful against melee squads. The others are more difficult to compare. Given all that I'd put the Greenspawn Assassin on the high side of value for his points. But how well he performs is up to actual playtesting. See the Playability section. Greenspawn Assassins are little green humanoid reptiles with a bunch of blades. "Little" is perhaps an understatement; these guys are almost as small as goblins (the Cutters, not the Brutes). Which is where my one minor theme complaint comes in; I don't usually expect tiny little guys like that to be such good fighters (4 atk/4 def). Really skilled I guess. Knife Throw Special Attack fits the model well, and Ambush is a neat power for a group of assassins. Ullar is a good fit given the Lizardfolk precedence. Overall good thematically. I really, really love Ambush. An uncommon heroes that syngerizes with more copies of itself is an untapped design space with many possibilities, and Ambush is a great example. Overall a solid concept, but Ambush really puts it over the top for me. Auggies alone had 58 when I checked. Good enough for me. I found Greenspawn Assassins to be valuable in a variety of builds: as primary attackers behind a screen, as range support, as a quick-strike unit, as assassins, as a horde, as filler, and even as defensive blockers. They are at their best when parked behind a screen, preferably Deathreavers due to their large numbers and Scatter ability. With a screen in place they are able to get the most out of Knife Throw. Most any melee army can act as a decent "screen" for them as well. Putting on order marker on a Greenspawn along with the "X" maximizes their order marker potential, allowing the melee force to act with the other two order markers. But the Greenies also work pretty well without a screen. With their good movement, solid attack, range special, and decent staying power they are a solid force wherever they go. In this role I would use their speed to engage opponents, often with height, and attack directly. If that failed, the second or third follow-up figure during an Ambush would Knife Throw that opponent engaged with the first one or two Greenspawns. That proved to be rather effective, and the Greenspawn Assassins out front often survived the counterattack due to their decent defenses. Horde builds are decently effective, but I learned quickly that a horde of uncommons is annoying and tiresome to play. Keeping track of which card belongs to which figure gets to be a pain after about three or so. Much worse is order marker management. Deciding which army cards to put order markers on is often difficult in a hero-based army, even without having to keep track of which figure belongs with which card. And while I have spoken of the Greenies' surviability, they are fragile enough to fall suddenly taking their order markers with them. Ambush makes order marker management even harder, as the one with the order markers has to be the last of the three to go. In almost any army they fit in well as filler, whether you add in one, two, or three. Their stats allow them to take on a variety of roles, depending on what they are with and their opponent's army. But this versatility is what I found issue with. They just have too much going on for 50 points. Whether you want them for their ranged special attack, or as fast and cheap 4-dice attackers, or even as a cheap blocker or glyph holder, they work really well for 50pts. They can also be brutal in multiplayer free-for-all games, throwing knives into brawls between other opponents. I really liked the overall concept for the Greenspawn Assassin, but I felt the little fella is just too useful for 50pts. Versatility has value in Heroscape (think Nilfheim), and perhaps especially so for filler units. The Greenspawn is a cool design and is tactically interesting to play, and is very close to being right. I would probably vote differently if he had one less attack, or one less defense, or maybe even one less move. I vote to induct the Greenspawn Assassin into the SoV. The figure is a Centaur Liutenant from Mage Knight. He fits in a single base. Here is a link of a store that has several of this figure. Caothic good: "saving people I don't like for reasons I don't quite understand"
Last edited by isaacgutierrez; September 4th, 2012 at 10:12 AM. You need to add availability information. Unfortunately, there are some typos on the card and some wording clarity issues in some of the powers--I don't think the judges will vote to review this card without some edits. to reveiw Dragan. The wording for Stampede needs work. Stampede needs to be reworded. See Valguard's First Assault for precedent. 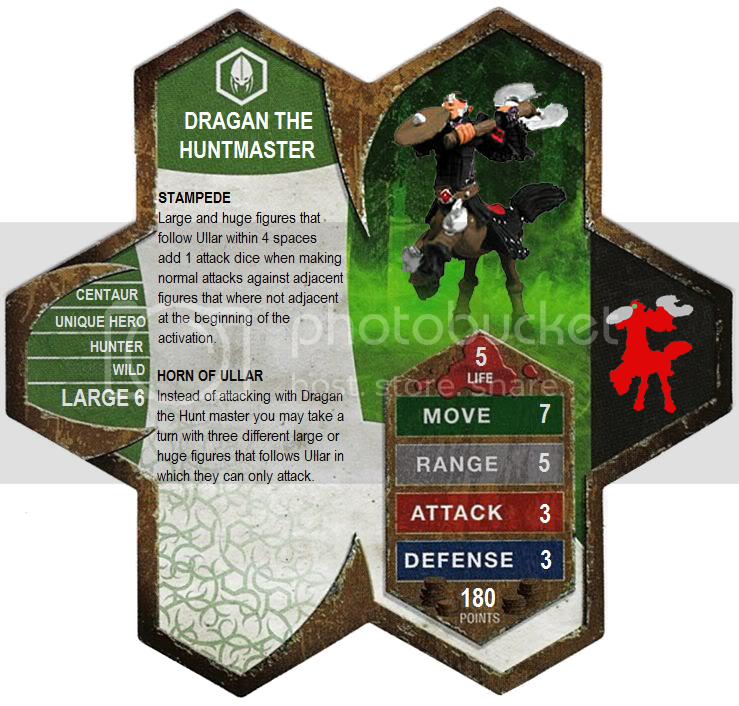 I'm also against Ullar's Horn in its current form, and not just because of the non-Heroscapy wording. It has the problem of turn stacking. See my review of Khophawet for my reasons for being against that. I suggest following the example of the C3V's Command Courier. I am perhaps a bit concerned about allowing Charos, Jotun, and ... uh ... Theracus(?) to all attack on the same order marker, though only allowing them to attack is very limiting. Though that could change dramatically if Fanscape releases some ranged large/huge for Ullar. I love theme in any game I play, and Cxurg'gyath has plenty of it. Pair him with some Mind Flayer Master Minds and even though they won't blow anyone out of the water consistently, you can still have a lot of fun with them. Better Enslave rolls? Yes please! No LoS needed to mess with your head (and your close friends)? Sign me up! Will Cxurg'gyath and his band of Mind Flayers rampage across the board and destroy you with your own troops followed by multiple mind bombs? It's possible, just ask the Gruts I fought against how they liked Grimnack snacking on them with an area attack on top. Your chances increase (with increased survivability) when you have a map with plenty of shadow tiles. Cxurgy does tend to turtle a bit in that case, staying in the shadows as much as possible, but I have no issue with more than one play style depending on the map. The thing that holds this guy back a bit is the 140 price tag when coupled with the 100 a pop for a Mind Flayer (the choice you can't help but want to make when constructing an army). Throw three of them in and you're already at 440 points. Not the best combo in the world at 500, but jump to 550, and now you can supplement with cheap (cannon fodder) common squads or an intimidating hero to distract your opponent while the meat of the army gets into place. I would have liked this guy at 120 as well, but 140 works well enough. The model fits in perfectly with Scape IMO and looks like it belongs with its counterparts. This figure is still in production so getting you're hands on one isn't an issue currently. A bit of a niche unit, but that's OK. Like I said, I love theme, and Cxurg'gyath brings plenty. Last edited by nyys; September 4th, 2012 at 01:43 PM. I vote NO to reveiw Dragan. 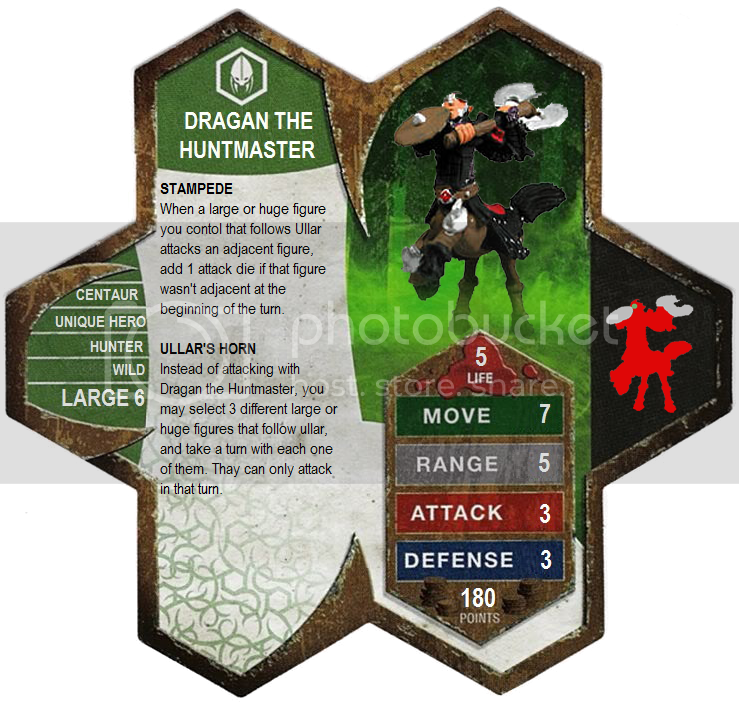 The wording for Stampede does need work and the availability of Mage Knight figures is awful, and that one is from an earlier set...where most figures are rare at best. It appears that Fanscape has a new addition, pending C3V approval. Yay! Sweet! Excited to see another SOV figure move through the process. Thanks for all your hard work guys and congrats Tolamos? This mindflayer seems to be a great figure ! Very good job ! Hello guys I came from the french forums and just dicovered the new "Mind Flayer master" (let's name him this way because this name is like...huh) and I'm a bit disapointed (in fact I'm completely disapointed). I really don't understand why he costs so much. Why not put it at 100? Then we could have 4x Mind Flayer+the master for 500 and everyone will be happy. You think 4xMind Flayer+Master for 500 points is a broken army? Come on it's a ****ty army which doesn't have his place in any tournament. So why put this thing at 140 points? Explain me, I'm listenning. Custom figures are usually not priced to make the obvious combination easy to do at normal point totals. Custom creators want to create unorthodox armies and strategies, and giving figures weird point totals helps. When custom creators do that, you are forced to play armies that combine two figures that may not traditionally work incredibly well together. That's why Cxurg'gyath isn't priced at 100, or even 120. Those totals make the strongest builds too easy to come up with. The SoV would rather have an underpowered figure make it than an overpowered figure. If you compare C3V's released figures with SoV's inducted figures, you will see that C3V has much stronger figures overall. I think that this is because if an overpowered figure gets inducted and does well in tournament settings, the SoV could (depending on how broken the figure in question is) be asked to remove the figure from their approved list. Whatever decision they make would look bad. C3V has the advantage of lots and lots of play testers. SoV is just a few people working together to try to make sure a figure is balanced. Cxurg'gyath is in no way overpowered, so he was chosen.